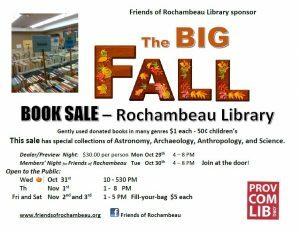 The BIG Fall Book Sale is BACK, at Rochambeau Library! Want to see more … ? Click the GIF! Over 15,000 books in 50+ genres including special collections of Astronomy, Archaeology, Anthropology, and Science selling for $1, and 50¢ for children’s books. View the whole list of rare books here, and check the “Book Sale” tab in the top right of this page for more info and photos. All materials have been donated by members of our community. 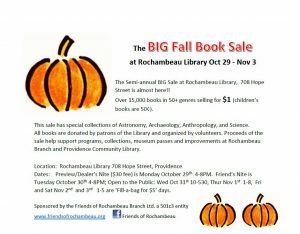 Proceeds of the sale help support programs, collections, and more at Rochambeau neighborhood library and the Providence Community Library system. Thank you to all of our wonderful volunteers and of course, to all of you shoppers! Friend’s Night is Tuesday October 30th 4-8PM – join at the door! Fri and Sat Nov 2nd and 3rd 1-5PM are ‘Fill-a-bag for $5’! 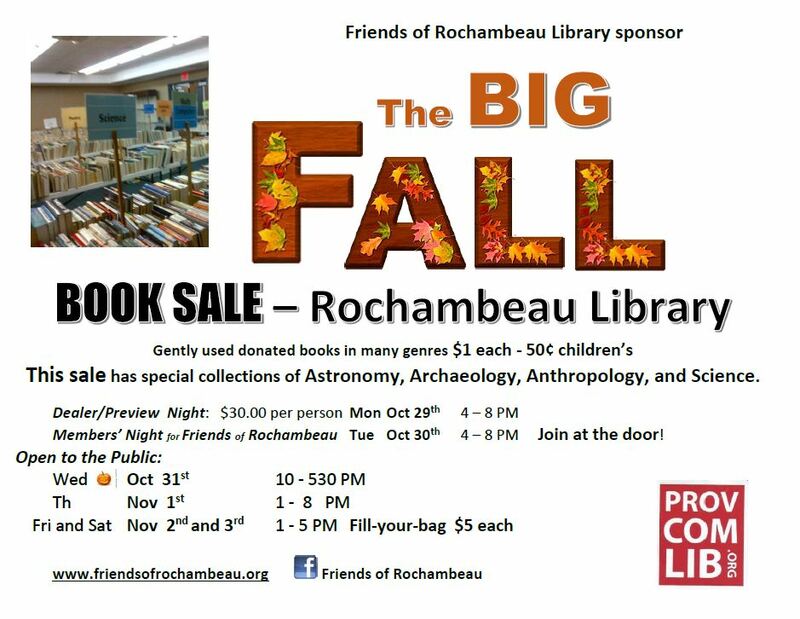 The Friends of Rochambeau is a 501(c)3 nonprofit organization supporting the work of our neighborhood location of PCL in our community. Why not become a Friend today? See the “Join the Friends” link just below our masthead at the top of this page! 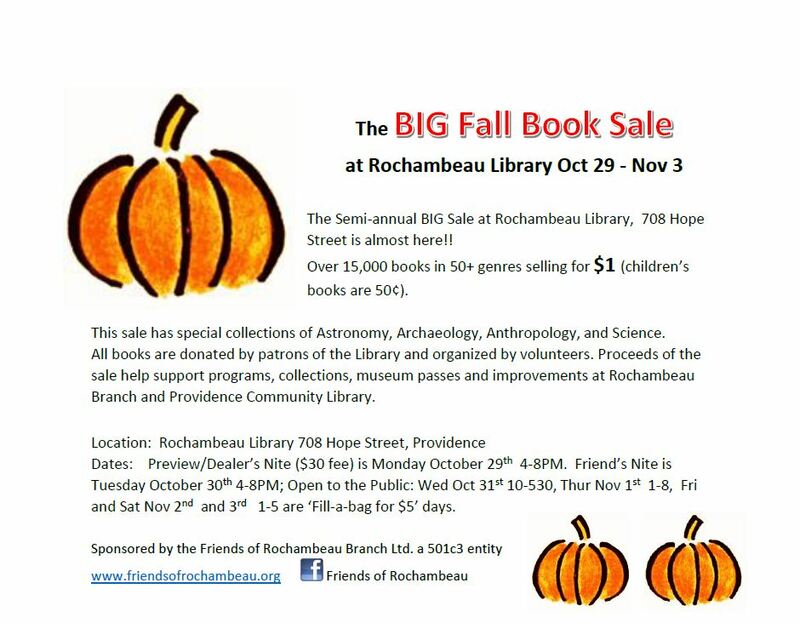 What is the best way to make a somewhat large donation of books to Rochambeau Library? I’ll probably have about 6 records sized boxes full of a variety of books we’ve had to cull out from our personal household collection. I know it book SALE time of year, but we’ve been meaning to do this for a while. Apologies if you haven’t been contacted yet about this question, but for large donations please contact us by email at booksale@friendsofrochambeau.org. Best time to bring in those boxes will be after November 5th. The Friends Accept donations all year. Bring in a bag or two or box or two and leave them in the bins outside the elevator on the ground floor of the library. You can get a receipt for the books at the circulation desk on the first floor of the library. Thank you for helping raise funds for the Library.